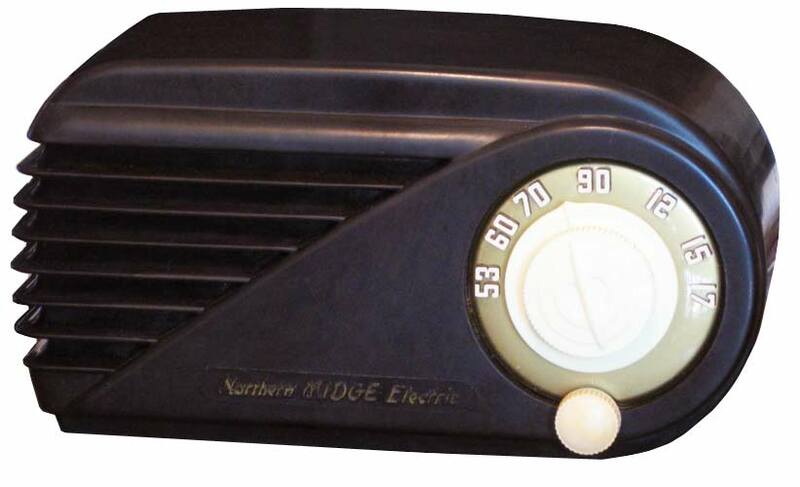 In the 1950s, Northern Electric was a Canadian manufacturer of consumer electronics and radios. The 5508 "Midge" has a nice streamline bullet cabinet design that clearly is based on the Farnsworth GT-051 design. In 1949, Farnsworth Television and Radio Corp faced financial problems and sold the business to International Telephone and Telgraph (ITT). Northern Electric had its early beginnings in the telephone and telegraph industry with several ties to AT&T among others, so they may have acquired the rights from ITT to use and manufacture the Farnsworth cabinet design for their "Midge" line of radios in the early 1950s. The radio design uses the standard superheterodyne AA5 with miniature tubes common during the 1950s, which is different from the octal tubes used in the original Farnsworth GT-051. Also the dial scale on the Farnsworth had 9 numbers ranging from 55 to 160, and Northern Electric changed the dial to 7 numbers ranging from 53 to 17.